Moving a counter-top microwave oven to a mount in your kitchen frees counter space, giving you more room for kitchen work. 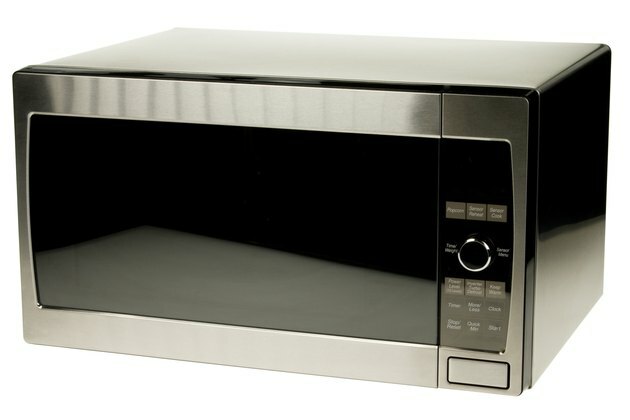 When shopping for a new microwave oven, you have the option of a mountable or a counter-top model, but it is possible to turn a counter-top model into a mountable model by using a microwave oven mounting kit. The kit includes a mounting plate that attaches to the bottom of a cabinet, letting the microwave oven hang above the counter. You can mount a microwave oven, even if it has a counter-top design. Pick a location under a kitchen cabinet where you want the microwave oven mounted. The cabinet should have wall space underneath it because the microwave oven will sit against the wall. Place a stud finder against the wall of the location you chose, and turn on the device. Slide the stud finder along the wall until the device's light flashes or you hear it beep, which indicates a wall stud is at that spot. Mark that spot with a pencil. Find other wall studs in the same way, and mark their location on the wall, too. Attach a 2-by-4-inch wood board to the bottom of the cabinet by using 4-inch long wood screws. The board will provide support and stability for the microwave oven. Set the mounting plate from a microwave oven mounting kit against the wall under the 2-by-4-inch board. Align the mounting plate's holes with marks you made for wall stud locations. Sink the screws from the mounting kit through the holes in the mounting plate and into wall studs. Find four L-shaped brackets in the mounting kit. Attach two of those brackets to the bottom of the mounting plate by screwing them into wall studs. Attach two other L-shaped brackets to the top of the mounting plate, screwing them into wall studs. Position the microwave oven against the mounting plate, centering the oven between the lower brackets and the upper brackets and wood board. Insert wood screws through the bottom of the cabinet and into the wood board. As long as the wood sits flush against the top of the microwave oven, it should provide enough support to hold the oven in place.